I had the great pleasure of hearing Zhena Muzyka speak at a luncheon yesterday hosted by the Santa Barbara chapter of NAWBO. 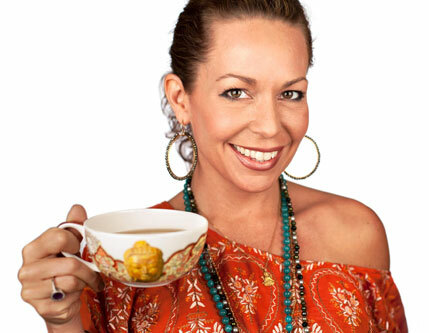 I've known Zhena for a long time, as the owner of Zhena's Gypsy Tea and a vendor to the specialty foods market where my husband has worked for many years cultivating relationships with vendors. I remember when her business was new, Zhena's elaborate and exotic booths at trade shows and her beautiful belly dancing outfits. I've always admired her loving and gracious approach to her work and her customers (even those of us on the periphery who show up at a trade show once a year!). Since those early days, her business has boomed, and she has become a titan of the socially responsible business movement and has branched out into writing, speaking and coaching. She's a role model in many areas, and yesterday she shared her philosophy and some of the concepts that have propelled the success of her business. Not surprisingly, these concepts will also help you build success as a speaker! 1. Identify and share your mission and your calling. This may seem a little "out there" to some of you who are giving presentations you're not particularly in love with. But bear with me. As I've talked about before, you need to have love and gratitude for your audience, because (quoting myself) "When you allow yourself to show love and gratitude to your audience, you can't help but forget about your own woes and distractions. When you allow yourself to be open to creating a human connection with your audience where you give them all your passion and energy and receive it back, you will find your anxiety and nervousness -- if not completely conquered -- at least greatly reduced." So there's one good reason for showing love and gratitude. But think of it this way: If your mission is only about making money, how is that serving the audience? If your mission is only about getting the next client, how is that serving the audience? That's about you, but it's not about them. And "them" is what they care about. The audience is there to receive something of value from you. Are you giving them what they need, want and care about? You must always have a deeper mission and a deeper calling for what you are bringing to the audience. You won't get customers and clients if you don't have a deeper connection to truly helping them accomplish something as a result of your presentation. 2. Entrepreneurs must see the invisible. Zhena shared a great quote that the manager of her tea estate has made into a sign to motivate the tea workers. It's a lovely example of seeing the invisible: most of the workers don't speak English, but in the future he envisions, they will. "One who can see the invisible can do the impossible." This quote is meaningful to me both as an entrepreneur and as a speaker. As an entrepreneur, I envision things every day that don't exist. Then I bring them into existence as programs, services and products that serve my clients and customers. I envision the shape, size, and design of my business and then I go about making it so. If you're an entrepreneur, have you seen the invisible? As a speaker, seeing the invisible can mean many things. Do you envision yourself on a big stage, reaching hundreds or thousands with your message -- but it hasn't happened yet? That's seeing the invisible! Do you imagine a time when you'll feel self-assured and confident in front of any size audience? That's seeing the invisible! Do you fantasize about creating an experience for your audience that's engaging, intriguing, entertaining, inspiring, and also income-producing -- but you don't quite know yet how to make it happen? That's seeing the invisible! Seeing the invisible means you have a vision and can move forward in the pursuit of that vision. It's an amazing superpower, but when you learn how to harness it, nothing is impossible! Zhena told a story about a potential investor in her company who was ready and willing to invest some sorely-needed cash. He asked her what she paid herself, and she told him (a very low figure by pretty much any standard), proud of herself for not taking a big salary and investing her profits back into the company. He told her it was "Way too much." You should have seen the audience's jaws drop and heard the audible gasp in the room when she told this story. Courageously, she walked away from the money. If you don't value your skills, expertise and experience, who else is going to? If you don't believe in yourself and your message, who else is going to? I have learned over the years that it's not worth it to me to undervalue my services just to get work. If someone doesn't want to pay my fee, I'm willing to negotiate lesser services. But I am not desperate for business, nor do I want to appear to be desperate by accepting low ball offers. The practical truth here is that it's going to be hard to promote your business or your speech if you don't have a sense of your own self-worth. Your skills, expertise and knowledge are worth more than you think. Own it, value it, charge for it. And above all, give and expect respect in all your business dealings. Add love and heart to everything you do. Valuable lessons for anyone in business, and valuable lessons for speakers at any level. Learn more about Zhena's speaking, coaching and other services here. Hi Lisa - sounds like the talk that Zhenya gave was very interesting and she sounds as if she has a very interesting approach to business. Love the quote - "One who can see the invisible can do the impossible." Thats what leadership is about. But I also think as speakers we need to be casting vision with our words about a future that we point others towards, a good speaker is a great storyteller and seeing the invisible and speaking that vision is about telling a good story. As Public speakers we are purveyors of the most powerful commodity of all, words. We are people who are interested in collecting clauses, assembling adjectives and positioning verbs in such as way as to educate, inform and inspire people to action. Words are persuasive. Words are permanent. Words are powerful. Words can convey hope and communicate happiness. Words can declare war and proclaim peace. Words can collapse governments and build nations. I am always inspired by the words "Some people see things that are and ask, Why? Some people dream of things that never were and ask, Why not?" (Shaw) - Thanks for a great post! Thanks for your reply, Peter. I agree that stories are everything to a speaker, and they can bring a whole new world to an audience. I also believe, though, that we can fall in love a little too much with our words, and forget to connect. I see this so often with speakers who try so hard to be clever, funny and eloquent, and who love to hear the sound of their own voice -- at the expense of building a relationship with the audience. So I agree that words are important, but it's also the gaps between the words where the connection happens. Thanks for the reply Lisa - I agree - you are right, its "gaps" that can convey much. Very interesting blog and site, thanks for all the content. Thanks for reading and participating, Peter!